You have made a wonderful choice in financially supporting your child/children in learning the Olympic sport of fencing. Fencing is a sport that teaches unparalleled discipline, personal accountability, how to overcome adversity, and is a sport that (mostly) attracts an assortment of wonderful characters. I began fencing when I was 9 years old, and it has largely defined who I am today. Participants in the sport would likely identify fencing as a “niche sport.” It will never reach the glamor and popularity of say, the NFL, the NHL, or the MLB, but the fencing community is rip-roariously passionate about the sport and most fencers love it with all their being. Throughout my years of fencing/coaching, I have seen many friends come and go. Some get jobs that prevent them from continuing. Some just decide that it’s time to move on to bigger and better things in life. Some simply “dial down” their level of effort put into the sport. But then—you get some who just outright burn out and never want to pick up a weapon again. And it is because of this burnout category that I wish to write you this letter, dear parents. Do not tell your child that he/she is learning fencing to get into a good college- Far too often, I see parents enrolling their kids in fencing because they think it is a vehicle to get into an Ivy League school. 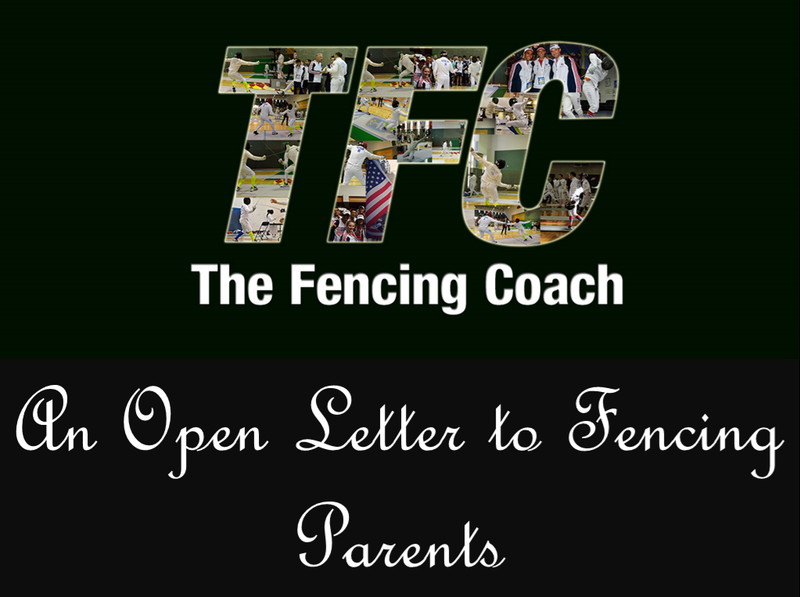 To an extent, they’re right—a good fencer has a higher chance of getting into a good school, but that’s not the proper lesson to teach your child. Unfortunately, this is something I see more than I would like. Not only does it put an inordinate amount of pressure on the fencer to perform, but it also sends the message that they shouldn’t pursue things for the joy of learning them. Not once in my life did my parents put that kind of pressure on me. I had good results in high school and ended up at Brandeis University. A happy ending. Praise your child for effort, praise them for winning, but do not berate them after a loss- Fencing is a harsh, harsh sport. And when your child suffers a tough loss, the emotions can often be tough to overcome. I have seen the wide range of parental guilt, from the screaming parent who breaks down their child until they cry, the harsh tongue of the tiger mom, and good old fashioned Jewish mother guilt (I recall a tournament I fenced in college where a kid gave up a few big leads and his mother yelled “SCHLOMO, THIS IS WHAT I PAID FOR?!!?!?!) If your child has put his/her best foot forward, trained hard, exhibited discipline and gave their all, then the role of the parent is to help the child overcome adversity. My parents taped all of my bouts in high school, and win or loss, we would sit down and watch together, figure out what could have gone better and make tweaks on my game heading into the next tournament. Not once was I scolded for a loss, but you better believe if I didn’t go 100% on the strip in victory or defeat I would get an earful. Use the sport to teach your child loyalty- There will come a time in every fencer’s career when they might outgrow their coach and have to move on to another. But too often, I see parents expecting instant gratification and shifting coaches around in a revolving door, expecting the quick swaps to yield quick results. Good coaches are just as much your family as they are your teachers. A good coach will not give up on his/her students as they learn the game of fencing, and it is of the utmost importance to return that favor and show your coaches loyalty. Don’t expect instant gratification- Fencing is a cyclical game of peaks, plateaus, and slumps. If you’re expecting your child to go to a NAC/Junior Olympics and make points in their first tournament, chances are, you’re going to be thoroughly disappointed. First time around, they’ll be lucky to make it out of pools alive. Every fencing tournament is an investment, and the more competitive experience your child gets, the quicker they will learn the nuances of the game. Have faith in your child, have faith in your coach, and remain supportive through both the trials and the errors. Don’t try to live vicariously through your child, and don’t benchmark them against their peers- Fencing is your child’s activity. Your job is to write the checks, provide support, and encourage hard work. If your mood ebbs and flows with the success of your child, then it is best to stay home. One father of a particularly good fencer used to proclaim “MY SON IS THE GOD OF CADETS!” And now the God of cadets has failed enough drug tests in the sport that you would think he was an MLB player. Why? Because his dad was a whifferninny. Oh—and remember, not everyone is going to be a Tim Morehouse/Jonathan Yergler/Gerek Meinhardt. So don’t judge your child if they’re not learning as quickly as their peers. Some fencers are late bloomers. You’ve picked a great sport—the greatest one in fact. Your coach will show your child the moves. Your child will learn the sport with your expectation that they’re giving their all. And you will see your child learn discipline, responsibility, and embark on a journey with wonderful friends they will keep their whole life. That’s the happy ending to the tale—just don’t stumble into any of the above pitfalls. Peace, love, and swordsmanship. I’m saving this for September and will reblog it then to give our parents old and new a heads up. Great post! Damien, thanks for this. Even restrained parents struggle with these challenges, and there are some very nice reminders in here. I have three fencers with very different relationships with their sport, and mine is a constant struggle to meet each of them where they are. Thanks for the insight – enjoying the blog so much. (The yelling one was the cornerstone of a particularly colorful dinner conversation!) – Cheers. This is really great! I like to think that I am not a “tiger mom”, and most days I am not, but things like this are really good to slap me back into place. Glad to hear he survived his first JOs. Thanks for reading. As a fencing mom, now fencing club manager- I am sharing this and your Parents Guide to Tournaments with the club. Excellent, concise advise! Great overall advice. I could see that I was quickly becoming one of “those” parents – in large part because of the coach, who would scream and berate my fencer, and demand I show some “tough love” and “back him up”. It was quickly escalating into not just verbal but emotional abuse. We made a switch to a different club and a new coach with a completely different approach, and I can not comment enough on how positive that has been. My fencer has bloomed in the supportive and positive environment. I have yet to hear the new coach raise his voice, let alone scream at a fencer for being “stupid”. So, even though I agree with the statement about “loyalty”, also trust your instincts if things aren’t going well, and find a coach that is going to be a good fit for your child – not just for technical development, but emotional as well. One size does not fit all. The second comment I would make is with respect to other fencers. One of the joys of fencing is the ability to meet lots of interesting people from, once you begin fencing internationally, around the world. My fencer has been hosted by some truly terrific people and has wonderful relationships. Facebook, Skype and other new media allow our young teens to stay connected to their friends on the other side of the world. We have always encouraged our fencer to make friends, and encouraged friendship and support of other fencers. However, my fencer is now at the stage where competition for a spot on the national squad is very intense. Some of the parents of the other fencers who are also in contention have told their fencers they are “not allowed” to speak to another fencer who may be their competitor for a slot, and to treat the other fencers like public enemy #1 with thinly concealed hostility. Not only is this counterproductive (if both get a slot, they have to work together on the team), but I also think it reinforces a particularly hideous negative human quality. Fantastic information for a parent of a child who is interested in starting fencing.What should our son and I look for when visiting potential fencing clubs. He is 11 years old. Paul, try to get a feel for if the club’s existence is based on collecting money or if it is out of joy for sharing the sport of fencing with others. Obviously, you want the latter. Look for a team oriented atmosphere, camaraderie, and most of all, are the people in the club having fun? That’s the kind of place you want to enroll your 11 year old. Wow, THANK YOU SO MUCH FOR WRITING THIS!! Glad you enjoyed thanks for reading. Este articulo debería ser leído de manera obligatoria, por cada representante que inicie a su hijo en el mundo de la esgrima. I never even thought about college and fencing. I signed my child up because he likes to sword fight and has since age 3. Now he is old enough to fence at 7. I didn’t tell Dad because dad does not like that violent stuff and thinks anything with swords is dangerous, though fencing is statistically the safest sport. I am thrilled my hyper child found something he likes!! I am happy to do this for him. It is also $6 a class; that is cheap. You’re doing it the right way! And your husband will find fencing isn’t really violent, it’s quite graceful. Damien, My son is 11 years old and has been interested in fencing since he took a class 2 years ago. The cost of fencing lessons has deterred me from signing him off . However, he has not found a sport he likes so I’m thinking of getting him into fencing. Is he too old to start fencing and be competitive? Not too old. 11 is a perfect age. Thank you. We live near Mason, Ohio if you have any recommendations for a fencing school. As a fencing Mom myself this is a philosophy I agree with wholeheartedly! My son has “rules” about what I can and can not discuss with him at a tournament and I try to respect his wishes. I am not his coach or his critic, I am his cheerleader, support and sometimes his shoulder to lean on. All are roles that we parents sometimes forget are just as important to the fencer as the coaching that they get from thier coaches. Hi, I’m a 14 year old freshman interested in beginning fencing but I’m not sure if I might be a little old. Could you tell me what the usual timeline is as far as competitions go? If you are interested and want to pursue it, there is no such thing as too old. Every coach has a different philosophy for when they throw their kids into competition. My criteria is simply when I feel they are ready. Great post. Something we need to do all the time is try to remind our fencing parents is to not pressure their kids, especially for potential college scholarships. We need to post something like your article on our website and in the club. Thanks for the ideas on how to approach this. Feel free to post in your club if you’d like. Thanks for reading! Thank you for your post. My 9 year old son and I have just begun fencing. I have always wanted to do it but was never in a position to take it up, and my son, when he saw me looking at our local fencing club online said that he wanted to do it too!. We are now ten lessons in and we are both hooked. I know that I will never be a competitive fencer (too old, too fat and too arthritic), but my son is having a ball and is chomping at the bit to be old enough (and skilled enough) to compete. My goal is to make sure it stays fun for him… College? Fine… Olympics? Who wouldn’t want to… but most important, have fun and do your best. I have 2 sons. One is 15 and fences epee for fun. He loves the sport and his friends at the club. The other son is 13, fences sabre and wants to be competitive. He has been given an opportunity to switch to a club with more training times/days and ranked fencers who want to mentor him. But the loyalty question has come up. As I read your article, I’m so confused. Am I just being flippant or am I making a good choice? How do you know as a parent?